The face of inner Sydney is set for big changes over the next couple of decades with many communities already uneasy about what is planned for their neighbourhoods. What is driving some of the changes inner Sydney communities are and will be facing? In the last year Urban Activation Precincts (UAPs) have been proclaimed in Randwick, Anzac Parade South, Mascot and Macquarie Park with the aim of substantially increasing development in these areas. We have also seen the light rail to link the City with Randwick or Kingsford announced, as well as a Sydney City Centre Access Strategy that will revolutionise how transport works in the City. Also announced have been the Westconnex, and the exploration of building over the railway lines from Central to Eveleigh. These and many other future developments are underpinned by the Regional Growth Plan for Sydney – the Draft Metropolitan Strategy for Sydney to 2031 (Metro Strategy). Sydney has had Metro Strategies before but this one is different because under the New Planning System for NSW these regional plans will become binding on lower level plans; sub-regional plans and local plans. While the Minister has backed away from some of his White Paper proposals, he has made it clear that getting people involved in big picture strategic planning will be a focus of the new system. In the many growth corridors and UAPs that are yet to be proclaimed, involvement in strategic planning will be even more important as the Minister wants it linked to “code assessable” development: where communities do not have a say on most development applications. While the new planning system is to be built around much improved community participation in forming strategic plans like the Metro Strategy, the Metro Strategy exhibition predated this new system yet still locks in strategies with which subsequent plans must agree. It went on exhibition just before and concurrently with the proposals for the new planning system. Awareness of the exhibition was low and many people just concentrated on the proposals for the new planning system and did not comment on the Metro Strategy at all. Seven hundred and twenty five people used an on-line petition and submission generator to ask for the Strategy to be re-exhibited when the New Planning System and new community engagement processes were in place. Only 420 other submissions were received – a long way short of the Minister’s goal of engaging a quarter of the community in strategic planning discussions. The next opportunity for community participation in broad strategic planning will come when the sub-regional delivery plan is developed. This plan will flesh out where the growth shown in the metro strategy will go and how the city shapers will be reflected into a sub-regional plan. The inner city is part of the “Central” sub-region in the Draft Metro Strategy which consists of 17 council areas from Mosman and Ryde to Botany and from Strathfield to the eastern suburbs. This is not to say everything waits until then, as there are already a number of Urban Activation Precincts (UAPs) declared which will do their own strategic planning as will the recently announced Central to Eveleigh Corridor. Developers also have been pushing for new UAPs so they can get on with building the homes it proposes. The Urban Taskforce in June 2013 proposed that the Government should allow UAPs within 800 metres of railway stations, town centres, along growth corridors and on key urban renewal sites. One of the problems of pulling out UAPs or areas like Central to Eveleigh from sub-regional and local planning is that these excised areas are not looked at in the wider context and considered as part of a wider ‘where do we put growth and how does it interface with the surrounding community?’ discussion. The ‘where’ decision is made by state government. The ‘how it interacts with surrounding development’ is addressed in the belief that there are limited opportunities for growth elsewhere and the excised area has to over-achieve to compensate. It matters not then for example that the City of Sydney Council’s recent Local Environment Plan had already accommodated the state’s growth targets. More development gets pushed in to the excised area pushing back development planned in other parts of the city. This is not a new process. The old Part 3A, now State Significant Development also excised sites from local planning and pushed up densities on a similar rationale. The density allowed on the CUB site in Chippendale is an example. Such mechanisms, alongside spot re-zonings, remain in the new system despite the supposed emphasis on community engagement in upfront strategic planning. The new planning system also contains a new mechanism which will have the same effect – Strategic Compatibility Certificates. They will allow developers to get approval for developments consistent with what is in the Metro Strategy before the community gets its say in the Sub-Regional Delivery Plans and new local plans. 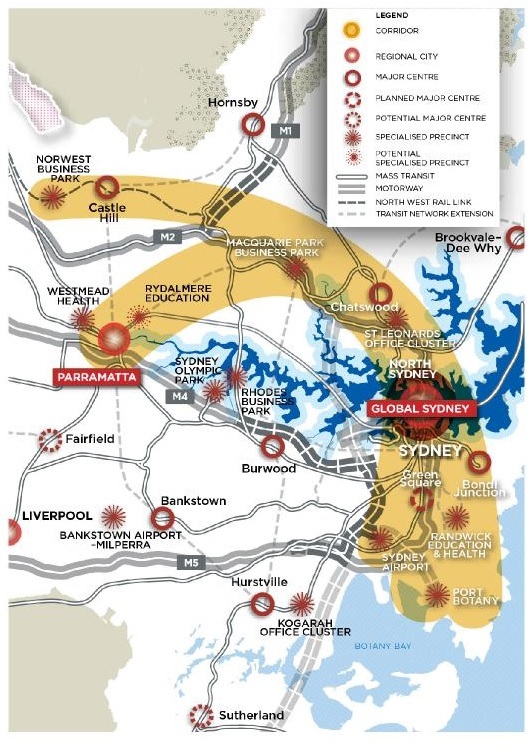 While the vast majority of the suburbs are untouched by the Metro Strategy proposals, the inner city straddles five of the nine key “city shapers” that drive the Metro Strategy – The Global Economic Corridor, Global Sydney, Sydney Harbour, Parramatta Road Corridor and the Anzac Parade Corridor (see box page 9). These Metro Strategy shapers push the state’s growth priorities into areas previously overseen by councils in a more local context. In some cases these state interventions, with incentives for councils, will be initiated or supported by councils as was the case for the Ryde Council’s push for the North Ryde and Macquarie Park UAPs. In others, like Randwick, the State Government initiated the process around the light rail proposal and the development of government owned land. Randwick Council argued it was not consulted before the decision was made to declare the UAPs. The boundary of Anzac Parade South has had a number of changes since the UAP was declared. 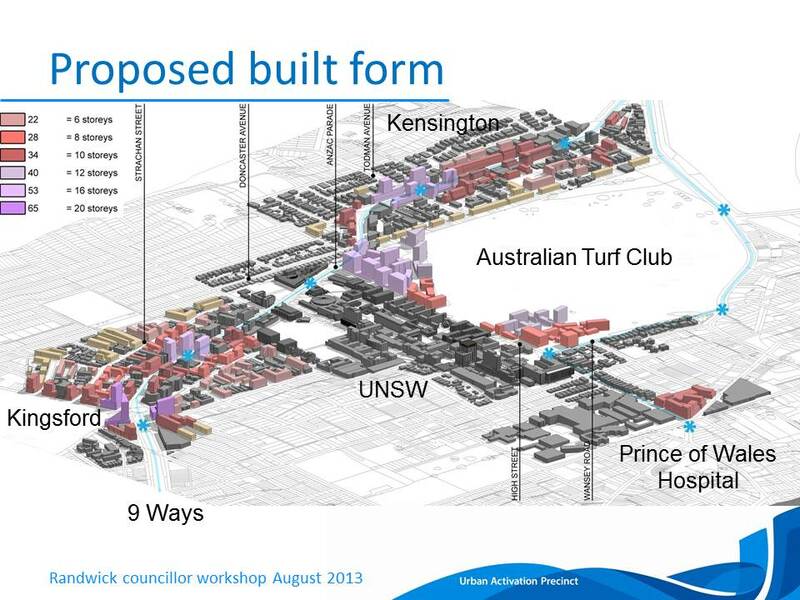 Graphic: Randwick UAP Draft Plan as at August 2013: Showing relationship between new light rail corridor in blue and the proposed built form to accommodate more people close to the transport corridor. Driving this change is Sydney’s growth. According to the Draft Metro Strategy the Central area subregion of 17 LGAs needs to provide 138,000 more homes for 242,000 more people between 2011 and 2031 and provide places for 230,000 more people to work. The Metro Strategy exhibition had only just finished when the Department of Planning released its Preliminary 2013 Population Projections which increased the Central sub­region’s projected population growth between 2011 and 2031 to 371,900. This would require a further 63,000 homes in the subregion on top of those in the Metro Strategy. The main driver for the increasing population in the inner city is overseas migration. The population growth will occur across all the sub-region but the main increases in the projections are in the following LGAs: City of Sydney (106,000); Ryde (33,600); Randwick (33,500); Canada Bay (28,200); Willoughby (20,100); Strathfield (19,400) and; Botany Bay (18,000). Much of the recent development in the inner city has been from redeveloping old buildings and industrial sites such as the ACI site, former CUB site or Ashmore estate. Large sites are beginning to dry up and a point will be reached where more difficult urban consolidation of smaller private lots will need to take place to allow for growth. Currently the approach is to up-zone areas where government would like to see increased density and let the market work. But this can be a slow process. In Regent Street Redfern the terrace shops south of the GCA towers were rezoned for up to 18 storeys but to achieve this, adjoining lots have to be consolidated to get the full increase and so far there has been no movement. The old Sydney Metropolitan Development Authority now UrbanGrowth Development Corporation has the power to compulsorily acquire private property and make it available for redevelopment but so far this power has not been used. Governments too have been looking at their landholdings to see if they can be used also for redevelopment. Large government owned sites are seen as low hanging fruit as they are already consolidated. The Central to Eveleigh Corridor proposal is an example. This corridor has heritage buildings that can be adaptively reused like Carriageworks. It also has land that can be used for new residential and commercial developments and public housing that can be redeveloped to accommodate higher density. In the long term there is also the possibility of using the air space above the railway line to provide new development space. Inner city public housing estates are caught up in the “perfect storm” of being large blocks of government owned land, run down housing with big maintenance backlogs and concentrations of disadvantage supposedly needing to be ‘socially mixed’. Redevelopment of public housing estates is seen as financially workable with the private sales funding new public housing on a 70% private housing / 30% public housing split. Given the Auditor General’s Report and recent comments from public housing’s Director General (see separate articles) it is not surprising that public housing will be a key focus for re-development in the inner city where land prices are high. There can also be a too cosy relationship between the land holder and the consent authority in the case of up-zoning public land. The Government makes the planning controls, so it has the ability to increase density and hence the value of government sites to try to get the best outcome for the department involved and the Government. For the North Eveleigh affordable housing approval recently the Government approved an extra storey above the earlier approved concept plan – all parties involved were related to the NSW Government. Sometimes there can be disagreement. For the proposed redevelopment of Redfern and Waterloo Public Housing Estates the draft controls proposed one in five public housing units be removed from the area – probably never to be replaced. Behind the scenes Land and Housing Corporation (LAHC), as the owner of the NSW public housing estates, pushed for taller buildings on the site so that they could retain a higher number of social housing units, while publically saying that they could not comment until “we see the planning controls”. In this case Government and community face the quandary of accommodating an additional 25% in density over the substantial increase already proposed or losing 700 units of scarce inner city public housing stock. We should see the outcome in 2014. The conflict of interest between Government setting controls and also benefiting from those controls is a key reason why communities need to have a good look at Government up-zoning of its own land. It is even more conflicted when the LAHC, as the owner of the NSW public housing estates, also has responsibility for managing the community engagement of its tenants around the redevelopment and determining what can and can’t be discussed in that process. This is an area that will need to be addressed under the new community participation processes in planning. The proposed redevelopment of inner city public housing estates is not confined to Redfern and Waterloo. The UAP proposed for Herring Road, Macquarie Park proposes the redevelopment of 230 public housing units in Ivanhoe Estate and the Anzac Parade South UAP covers 2,500 public housing units in the 5 public housing estates in the Maroubra – Malabar area. At least when it owns the land the Government captures the value uplift. On private sites, rezoning currently puts the windfall into the pocket of the land owner or developer. In Vancouver the government aims to capture around 70% of uplifts from rezoning to fund community facilities and affordable housing. Capturing this uplift is not happening in NSW and in the new planning system there is no longer a mechanism to capture new funds for affordable housing. One of the problems in a high level document like the Metro Strategy is knowing how prescriptive are the lines on the maps. The Parramatta Corridor City Shaper is a case in point. The hatched area for the corridor covers parts of Haberfield, where heritage homes sit on large blocks attractive to developers. The Metro Strategy says it will ‘capitalise on the delivery of the WestConnex Motorway and plan for staged urban renewal throughout the corridor’s many centres’. Does the coloured band of hatching mean this applies to you if you fall in that area or is this just indicative? Residents in the area wonder when they might be targeted for renewal. It was not surprising that a large number of people attended a public meeting about WestConnex in October at Leichardt Town Hall. The recent announcement of the Central to Eveleigh Corridor referenced the Metro Strategy as its basis. 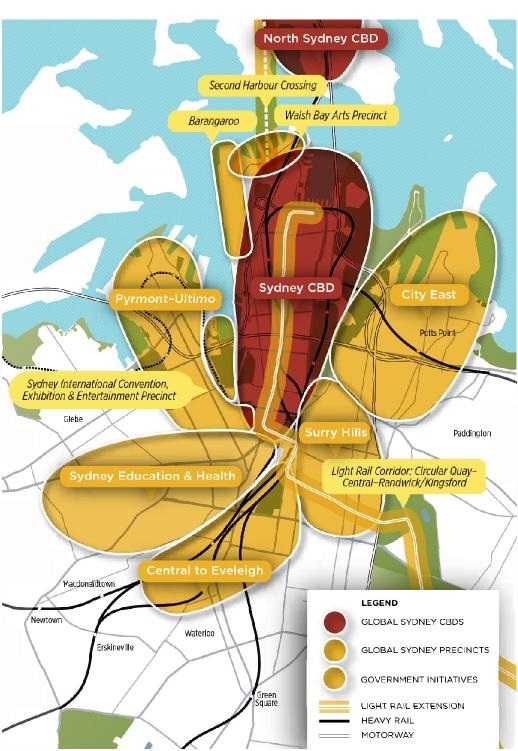 This corridor appears as one of the Global Sydney map areas and it proposed in this corridor to ‘support strategic renewal of this highly accessible corridor’. Residents in Chippendale wonder if their presence in the ‘Sydney Education and Health’ area might be used to sanction the swallowing up of Chippendale by the expanding Notre Dame University in the way that much of Darlington disappeared in the 1970s into an expanding Sydney University. The People Unite Surry Hills (PUSH) campaign to move the light rail corridor through Surry Hills so it does not impact on Devonshire Street and destroy the buildings through which it will pass is taking on a City Shaper priority which is also the basis of the Anzac Parade City Shaper and the Randwick UAPs. PUSH’s campaign reminds us that change does not benefit everyone. Projects that create a public good can also create collateral damage on those that are impacted by the change. This impact is not just if the light rail goes through your unit, it is also for those whose inner city suburbs are getting more high rise developments, experiencing more traffic and parking pressure and facing public transport congestion as their buses go past their stop already full. It is also about the currently strained local amenities becoming even more strained; the lack of pre-schools, schools, playing fields and public amenities are examples. Despite the cry from developers and government that all reaction to change is driven by ‘not in my back yard’ (NIMBY) concerns, there are genuine issues raised by local communities that must be addressed by government, planners and developers. Any collateral damage on local communities from implementing state priorities need to be recognised and mitigated or compensated. The outcome needs to produce “quality in my back yard” (QIMBY). Resident Group REDWatch held a roundtable mid 2013 on “NIMBY – The Good the Bad the Ugly”. They put together a “NIMBY Discussion Starter” that groups can use to discuss this issue. NSW’s new planning system proposes unprecedented community engagement in the planning process with a legislated Community Participation Charter. This provides an opportunity for communities to raise their concerns and to seek to have them addressed. As the system rolls out there is the possibility for communities to push the consultation envelope to try to ensure their concerns are understood and addressed. This is not to say that resident action groups will become a thing of the past by any means, but that there will be new spaces for communities and their groups to raise their concerns and to push for outcomes that work for both existing and future communities. The extent to which the new community engagement process works will determine if it is possible to get agreement about the future shape of the inner city between Government pushing its big picture changes and the impacted communities. If it does not work then the Government will not get community sign up for the changes and battles over development that have characterised the inner city for decades will continue into the future. You will find other articles in this issue of Inner Sydney Voice that provide helpful perspectives on some of these issues faced by inner city communities. The Global Economic Corridor (see above) extends from Port Botany and Sydney Airport, through Global Sydney to Macquarie Park. It includes centres such as Chatswood and Bondi Junction, the specialised precincts of St Leonards and Macquarie Park, four large universities and major health and entertainment precincts. Around 50 per cent of NSW Gross State Product is concentrated within the Global Economic Corridor. Global Sydney (see above) is made up of Sydney CBD and adjacent precincts and the CBD of North Sydney. It is the most highly sought after investment location and most internationally visible area of Sydney. Accounting for over $99 billion (or just over one third) of the NSW gross regional product, Global Sydney is Australia’s most significant concentration of economic, educational, medical, creative and cultural activity in Australia. Sydney Harbour is the defining feature of Sydney and one of our biggest economic advantages. It has influenced where and how Sydney has grown and attracts considerable investment from both public and private sectors. Over the next 20 years, Sydney Harbour and its surroundings will continue to be the major economic driver for our city. It is the site of a nationally significant working port complementing Port Botany, a national and international tourist attraction, a destination of cruise ship companies and a sought-after location for investment in housing and commerce. The Parramatta Road Corridor connects Global Sydney and Parramatta via Sydney Olympic Park. It is one of the busiest road corridors in Sydney. The WestConnex Motorway will provide opportunities to transform the local centres that exist alongside the Corridor and better connect them as Sydney Olympic Park grows. The Parramatta Road Corridor offers prime regeneration opportunities to create lively, well-designed centres with improved north-south and east-west linkages currently limited by the busy Parramatta Road. This will help to deliver a diversity of housing and jobs choices, close to the shops and services in a new, liveable context.